“The Land of Lincoln.” I hope you intoned that James Earl Jones style. (Think: “Arby’s! We Have the Meats!). Illinois is our first stop on the home stretch of the Greatest Road Trip Ever Taken. Illinois is one of the nation’s most influential states, and one of its oldest. It was granted Statehood clear back in 1818, as the 21st one to be granted official status in the Union. Illinois is bordered on the north by Wisconsin, and on the northeast by Lake Michigan. Indiana sits to the east. Illinois is a northern state, but surprisingly Kentucky provides about 56 miles worth of border on the southeast. Missouri is to the west and southwest. Iowa provides the northwestern border. Illinois is one of the states with the smallest differential between highest and lowest point. Charles Mound, near the Wisconsin border in northwest Illinois, is the highest point, standing 1,235 feet above sea level. The low point is found at the confluence of the Mississippi and Ohio Rivers, 280 feet above sea level. The geographic center of the Illinois is in Logan County’s tiny town called Chestnut. Springfield is the capital. Chicago is, far and away, the largest city. Those two are joined by Aurora, Rockford, Joliet, Naperville, Peoria, and Elgin as Illinois cities exceeding 100,000 in population. The presence of Chicago, which dominates the northeast corner of the state, reminds us of a topic we discussed out west in Oregon and Washington. How much influence does the big city have over the rest of the state? Is the rest of the state overwhelmed and under-heard? Is there an urban/rural divide in terms of thought process? In a word, yes. Former Canadian Prime Minister Pierre Trudeau once said about being neighbors with the United States, “It’s like sleeping with an elephant. No matter how friendly and even-tempered is the beast, one is affected by every twitch and grunt.” So it is for the residents of most of Illinois. Chicago is the political and economic driver of the entire region. Rural Illinois, particularly in the southern part of the state, reliably votes Republican. That matters little, however, as Chicago is one of the great Democratic strongholds in the country. The rural/urban divide is everywhere, but nowhere is it more prominent than in Illinois. According to the Tax Foundation, Illinois is on the high side in terms of the value of a dollar. Again, that is the Chicago influence in play. An average American dollar is worth about 98 cents, overall. Outside Chicagoland, though, prices are much lower. Abraham Lincoln Capital in Springfield serves over 70,000 passengers a year. Over half of them are flying to Chicago. University of Illinois-Willard greets about 80,000 customers a year from the Champaign-Urbana-area. The majority are traveling to Chicago. Central Illinois Regional at Bloomington-Normal sees over 210,000 flyers a year. Atlanta is the favorite destination. Quad City International is host to almost 400,000 passengers a year. Chicago is the most common destination. General Wayne A. Downing Peoria International flies almost a half million customers each year. Chicago is the favorite destination. Chicago Midway International is the smaller of the two big airports in Chicago, serving almost 10 million travelers a year from the south side. Atlanta is the top destination. O’Hare International greets almost 33 million passengers a year on Chicago’s North Side. New York City is the favorite domestic route. London is the top international route. Presidents Ronald Reagan and First Ladies Betty Ford and Michelle Obama. Military/Politics: William Jennings Bryan, Hillary Clinton, Betty Friedan, Jane Addams, and Chief Black Hawk. Actors: Gillian Anderson, Raquel Welch, Mary Astor, Robin Williams, Gloria Swanson, Betty White, Jennie Garth, Kevin Quinn, Bill Murray, William Holden, Rock Hudson, Jennifer Morrison, Chloe Bennett, Ben Savage, Landry Bender, McLean Stevenson, Melissa McCarthy, Charlton Heston, Stefanie Scott, Danielle Campbell, Keke Palmer, Harrison Ford, Bob Newhart, and Ethan Cutkosky. Entertainers: Pete Wentz, Lil Durk, Burl Ives, Florenz Ziegfeld, Nia Kay, Patrick Stump, Chance the Rapper, Famous Dex, Walt Disney, Chief Keef, Quincy Jones, Jack Benny, Jeremih Felton, Preston Sturges, Gower Champion, Richard Pryor, Cindy Crawford, Miles Davis, Walt Disney, Benny Goodman, Toni Romiti, and Ludacris. Authors: Franklin Pierce Adams, Irving Wallace, Ray Bradbury, Edgar Rice Burroughs, Carl Van Doren, Raymond Chandler, John Dos Passos, James T. Farrell, John Gunther, Ernest Hemingway, James Jones, David Mamet, Frank Norris, Drew Pearson, and William L. Shirer. Athletes: Dorothy Hamill, Lou Boudreau, Rickey Henderson, Jim Thome, Ed Kinsella, Dwayne Wade, Derrick Rose, C.M. Punk, and Jimmy Connors. The Lincoln-Douglas debates that focused attention on the issue of slavery were held in Ottawa, Freeport, Jonesboro, Charleston, Galesburg, Quincy, and Alton. In 1893 the world’s first aquarium opened in Chicago. The early Mormons fled Nauvoo, eventually landing in Salt Lake City. The first McDonald’s opened in Des Plaines. 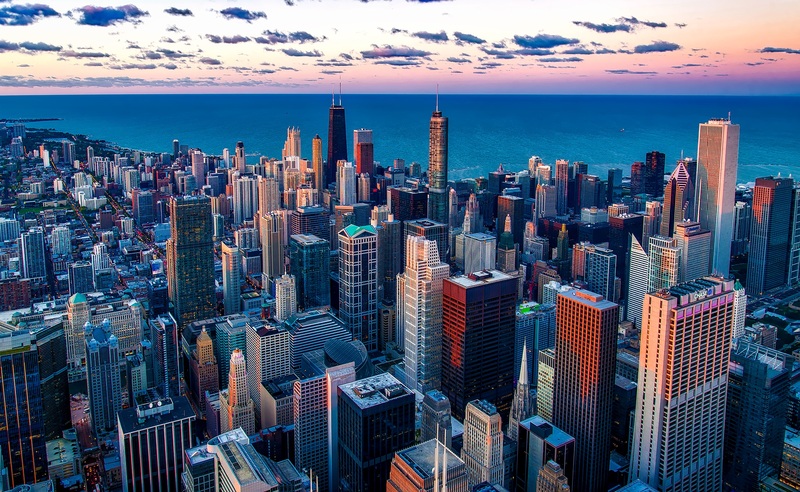 Chicago is nicknamed “The Windy City.” Though most believe the name is derived from the breezes off Lake Michigan, the nickname originally referred to the talkative nature of Chicago politicians. The Chicago River is dyed green every St. Patrick’s Day. Make those feet hit the floor because we’re off to Illinois! We will see some highlights, some spots from on high, and learn some history on the way. Get up! We’re only on the road for 211 miles, but it will cover some of the most interesting things we have seen yet. Remember how we started by saying this is “The Land of Lincoln?” We’re going to start at the Abraham Lincoln Presidential Library and Museum in Springfield. It will be the first such library we have visited anywhere in the nation. You know, more than one state claims Lincoln. He was that much bigger than life. Here in Illinois, the license plates stake the claim. That’s because he made his first marks as a politician in Illinois, but he was born in Kentucky. Occupying an entire city block in Springfield, the Abraham Lincoln Presidential Museum is the largest such museum anywhere. Inside the massive building, 50,000 square feet are devoted to immersion exhibits, special effects theaters, and artifact displays. Particularly moving is the sight of Abraham Lincoln’s top hat. It is the hat he wore to the play, “My American Cousin” the night he was assassinated. We will spend the day at the Museum and Presidential Library. We will overnight at Country Inn and Suites for $93. 191 miles (and 115 years) from the Lincoln Museum, we find ourselves in the city of Berwyn. That’s where we will go to the Berwyn Route 66 Museum. It is only appropriate that we stop here as we begin our trip through the seven states that were a part of Route 66. Route 66 has been around since the 1930’s but it was in the late 50s and early 60s that it became “the place to be.” It was America at her most muscular, as the planet’s only superpower after World War II broke Germany and economically crippled Russia. How did we celebrate? America hit the road. We were looking for adventure, or whatever came our way. Yes, we were born to be wild! The open road called, and we found towns and cities waiting with open arms. Every town had a drive-in burger place, a gift shop, and a drive-in movie theater. Roadside motels popped up every couple of miles. They had names like EZ Rest Motel and Lazy Dayz Inn. For a few dollars a night, we took our rest before getting back on the road. It was Route 66, man! The United States of America, as seen through the windshield of a blue ’58 Chevy Biscayne! The Berwyn Route 66 Museum is free to enter, and it has maps and trip ideas scattered throughout. It is a trip back in time as we embark on the route itself. If you squint on a clear day, you can see it from Berwyn. Chicago! They call it, among other things, “The City of Broad Shoulders.” You see, the people of Chicago bear up under pretty harsh conditions. One of the few cities in the world where the weather can kill you at either extreme, Chicago is home to hard-working, hard-playing, hardy souls who love their city completely. To begin our visit to Chicago, we’re going way up high! It’s called Chicago 360. We’ll ride one of the world’s fastest elevators and enjoy expansive views from the 94th floor of the John Hancock Building. Enjoy the full panoramic view of Chicago! We haven’t done anything quite like this before. We are almost half again as high as we were at Seattle’s Space Needle. From there, we will go down to historic Navy Pier. It’s Chicago’s lakefront playground and the Midwest’s top tourist destination. What makes it Number One? Well, it attracts more than 8.6 million visitors a year! We’re going to ride the famous Navy Pier Ferris Wheel. From just halfway up, we will fall in love with the city. From the top, we will wonder why everyone doesn’t come and do this every year. The sights of the city on one side and Lake Michigan on the other make us want the ride to go on forever, but Navy Pier is more than a big wheel. There are entertainers and even circus acts going on down below. We’ll grab some world-famous Garrett’s popcorn and wander around for a bit. Here we will see people from all over the country, gathered together in one glorious place. Before we leave, we will walk to the end of the pier, and look back. It is Chicago as it can’t be seen from anywhere else. We will spend the first of three nights at the Millennium Knickerbocker Hotel for $85 a night. A good value for big city lodging. Are you ready for a magnificent day? That isn’t hyperbole (well, maybe a little). Today we are going to The Magnificent Mile! What makes it magnificent? I’m so glad you asked. We haven’t spent much time this trip on pure shopping mania, but that all changes today! Every store known to man is here. Bloomingdale’s? Natch. Sak’s Fifth Avenue? Gotcha! Nordstrom? Yes, indeed! Oh, you say you can find those stores elsewhere? How about Tommy Bahama, Ann Taylor, and Hugo Boss? Would you like some things to fix up your home? How about Crate and Barrel and Le Creuset Boutique? Do you think we’re done with today’s fun? Not even close. From the Magnificent Mile, I’ve booked a lunch cruise with Odyssey Cruise Lines. We will have a bite and see Chicago from the lake, all for less than $55 a person. Chances are, we haven’t polished off the Magnificent Mile at lunch time. We’ll hit the rest of the stores this afternoon. Then a good night’s sleep, because tomorrow, we’re getting our art on. The Art Institute of Chicago is one of this countries finest museums of its kind. Not only is it a beautiful museum, but each room is filled with wondrous sights. We’ll see original famous works by Monet, Van Gogh, Andy Warhol, Pablo Picasso, and so many more! It will be a both stunning and impressive way to spend a few hours. Many people find the impressionist galleries to be the highlight. We will finish our trip to Chicago with lunch in Terzo Piano on the museum’s 3rd floor. There we will ponder the trip we just took, and plan to come back. We sincerely hoped we whet your appetite to take a trip to and through Illinois. Next up: Missouri.